This homemade butter churner is a modern upgrade to an old-fashioned model that was used for decades. Silicone paddles and stainless steel gears make it long-lasting and food-safe. All you need is heavy cream and about 10 minutes of handle turning. Watch through the glass jar as your butter—and some bonus buttermilk, too—takes shape. Dimensions: 6.5" x 4.3" x 10.6"
I used the butter churn last week and it worked just as described. My family was excited to have fresh churned butter for dinner. I love the butter I personally created and is was fun to do. Sister in law will display it but not use it. I thought it was really nice and very well made. Makes great butter with many flavor options. My son makes butter with his 4 and 6 year old daughters. They love it. 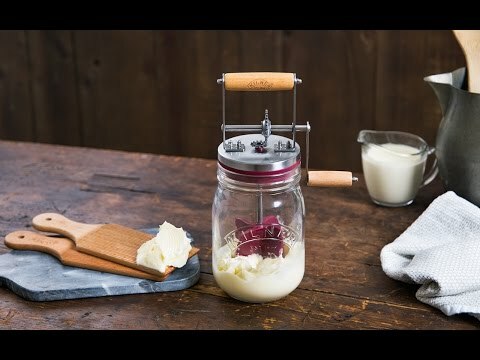 Even if you swear you’re not handy in the kitchen, this homemade butter churner lets you make your own butter in about 10 minutes. It’s as easy as turning the handle. 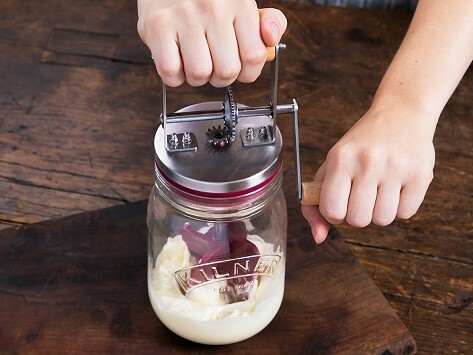 Kilner has been England’s trusted name for glass since the 1840’s, so they were the right folks to revamp the old-school butter churner. Theirs follows the original design but with a few modern tweaks. The gears are made from stainless steel to wash easily and avoid rust, while the paddles and lid seal are made from food grade silicone. All you need is heavy cream and a little effort. When the butter takes shape, you’ll also have buttermilk—a tasty byproduct—to cook and bake with, too. Once you see how simple it is, you’ll be a churning convert. This 21st century update on the standard churner makes it easy.